Red Sea’s REEFER™ series of Reef Systems provide advanced hobbyists with a solid foundation for building a fully featured reef or marine aquarium. The Kauderni is a sophisticated saltwater aquarium that combines stylish design and perfect functionality. Furthermore, it is easy to operate. 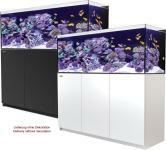 Stylish Saltwater aquarium incl. cabinet filter system.